One project that I found particularly interesting was collecting and testing poop samples for worms, followed by treating (drenching) the flock of over 1,000 sheep the next day. 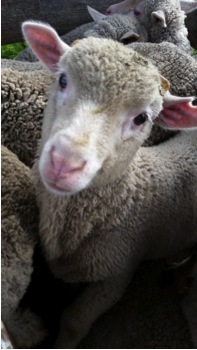 The flock was made up of lambs and ewes that now need to be separated, so the process was to herd a group of sheep into the race (a narrow space that allows for easier access to/more control over the sheep), vaccinating the lambs, drenching the lambs and ewes for worms, and checking for any lambs that still had tails. Lambs that did have tails were taken out of the race so that their tails could be removed i.e. cut off with a hot knife. The lambs, most of which were males with large horns, were not particularly enthused by this process and I had to wrestle them into the correct position and hold them there. I managed to walk away with only one battle scar. During my stay I also had the opportunity to learn to drive stick shift (and on the left side of the road), the atv, and, my favorite, the dirt bike. 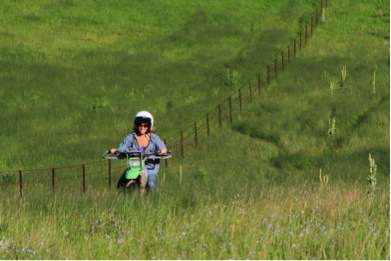 As someone who was exceedingly cautious when I learned to drive a car, learning to ride a dirt bike was terrifying but exhilarating, as you are safer (defined as less likely to fall over should you hit a rock or stick which is fairly common in the middle of a field of tall grass) when you are traveling faster. Michael, my host, made little effort to go easy on me, leading me through trees and up rocky hills my third or fourth time on the bike. Due to my enthusiasm about the bike, as well as the diversity of wildlife on the farm, we went on several excursions to chase kangaroos and find rare birds in the far paddocks. The Taylors welcomed me into their family and their life more than I ever could have hoped for. 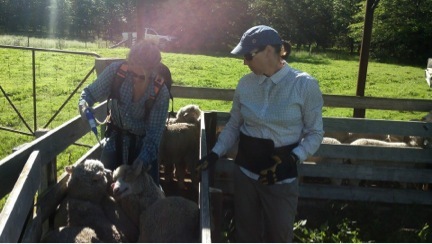 I learned an incredible amount about the science of sheep farming, the flora and fauna of Australia, and the amazing people who inhabit the vast open spaces of rural New South Wales. The original purpose of my trip was to write short stories, and while I did write, I was not as prolific as I had originally intended. This was not from lack of inspiration or lack of drive, but rather from a need to learn and experience as much as possible before I felt I could write about Australia and the people there in a way that was honest and true. After three short weeks I’m still not positive I can, but I know the experiences and stories and characters I created and encountered during my trip will influence my life and my writing for many years to come.